On June 19, Dah Sing Financial (0440) announced the completion of the “Dah Sing-Life “ deal, i.e. the closing sale of its Hong Kong life-insurance business, while having received $8.03 billion as the proceeds of the said deal from the purchaser, Thaihot Investment, a mainland company. Since then, Dah Sing has called for a directors’ meeting, scheduled to be held on June 26th, for the purpose of duly passing a resolution, concerning the distribution of a special cash dividend of $6.60 per share, as previously proposed. 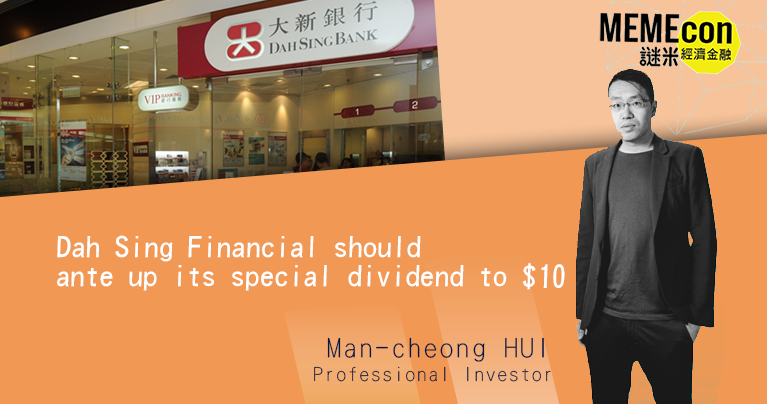 While it looks set to be cash-rich, even after the special cash dividend distribution has been implemented, and given that a significant price discount-to-NAV would still be evident in the Dah Sing Group of companies' share valuation after the distribution, we hereby urge the board of directors, to either ante up the special cash dividend amount once and for all, or, to make an additional special cash dividend distribution happen immediately thereafter. In this connection, shareholders are strongly advised to proactively voice out their specific concerns, as appropriate. As I’ve pointed out earlier, while Thaihot Investment has been expected to come up with the required remittance of funds to close the deal without too much of a problem, it’s but a matter of time that the Dah Sing Life deal would then be approved and completed accordingly. As it turned out, the Hong Kong Dah Sing Life insurance business deal had been completed by mid-June; whereas similar insurance business in Macau, although maybe on a much smaller scale, has yet to be completed. As per Thaihot Investment’s recent press release, however, it is envisioned that the approval from the Macau authorities would be granted soon enough, while Mr. Harold Tsu-Hing Wong, the vice-chairman of Dah Sing Bank, will be participating the signing ceremony. According to the announcement from Dah Sing Financial, though, the net proceeds after expenses, resulting from the Hong Kong insurance business deal, is about $7.95 billion, while enabling a $3.5 billion pre-tax income. 4) no less than $3.3 billion of the remaining proceeds will be used as general working capital of Dah Sing Financial, and/or for re-investment in its businesses. 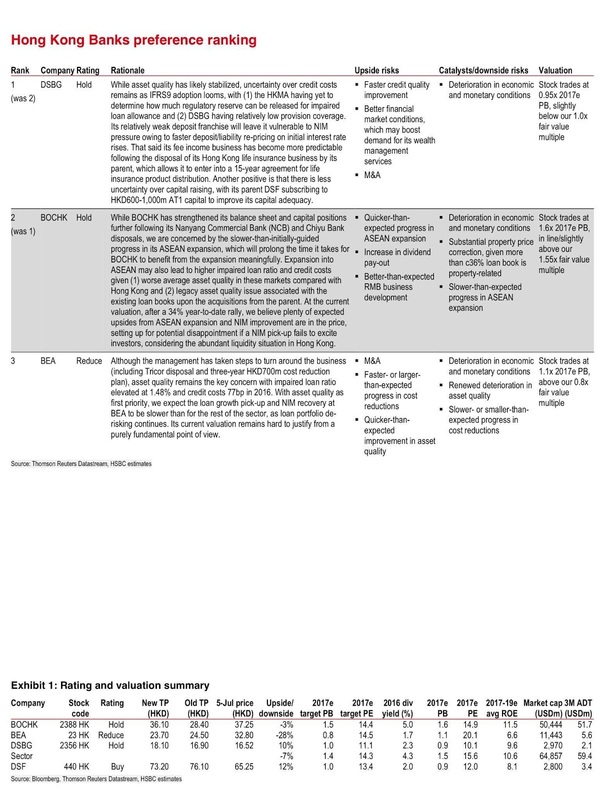 As I’ve noted before, too, Dah Sing Financial no longer requires to maintain a huge cash-capital base after the life insurance sale, and as a result, its cash position should be strong enough to distribute a special cash dividend of as much as $20 per share. In fact, now the use of the proceeds appears to have coincided with the rationale of the aforesaid argument. For example, out of the approximate $8 billion proceeds, reinvesting in Dah Sing Bank, the crown jewel of the Group, requires just as little as $600 million to $1 billion. On the other hand, as much as $3.3 billion, or as high as $9.85 per share, have been designated for its working capital sourcing. Which means if the same is chosen as a means of distribution, at least $16.45 per share as special cash dividend can materialize. Yet, whether or not Dah Sing Financial should maintain up to $1.45 billion as cash-on-hand, is debatable. 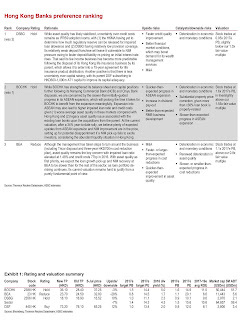 A review of Dah Sing-Life deal’s announcement would most certainly indicate, that the disposal of Hong Kong and Macau insurance businesses already registered a net asset value that could be worth $3.7 billion, while the net asset value of the remaining general insurance businesses in the Group, would just worth $700 million. That said, given a saturated insurance market, a decreasing trend in demand for high-profit margin and capital, for it to have their capital base dramatically elevated to twice as much as its NAV, is far from realistic. This is notwithstanding the fact that an increase in capital stands to enhance the probability of a potential merger-and-acquisition (M&A). A Deutsche Bank report has pointed out, that the recent completion of the Dah Sing Life Hong Kong business deal should help eliminate the risk of the deal falling through, thereby enabling an upbeat outlook. After the special dividend, it says, there remains a lot of excess cash capital at the Dah Sing Financial level, something equivalent to as much as $9.85 per share, or, 15% of equity, as at 2016 second half. Such a scenario, it says, is able to induce investors looking forward to a higher dividend rewards, in the long run. This has made Deutsche Bank choose Dah Sing Financial and Dah Sing Banking (2356) as their top picks among its Hong Kong bank counterparts. Not to mention, that the valuation is still far from high, given a high propensity for being a long-term M&A target. JP Morgan also notes that the completion of the insurance sale, in part, is set to render investors a peace of mind, resulting in a positive market sentiment in the short run. Yet it is quick to point out, that a special dividend of as low as $6.60 per share, is not only far from its plausible forecast of $12.00, but it also means something like 63% of the total proceeds from the deal, resulting in an excess-cash-capital scenario in the part of Dah Sing Financial more severe than expected, triggering a more negative shareholder return forecast (lower than the current 30-50 points projection) outlook than envisaged. A payout ratio exceeding 10% is set to protect the share price from downward momentum, notwithstanding. These two and other reports show that financial houses are mostly of the opinion that after a special dividend of $6.60, there is still excess cash capital in Dah Sing Financial. The marketplace appears to have reached a consensus on that, too. After the partial completion of the Dah Sing Life deal, its share price rose only 5% and Dah Sing Banking 1.4% (as at June 27). Let’s do some simple 'maths'. 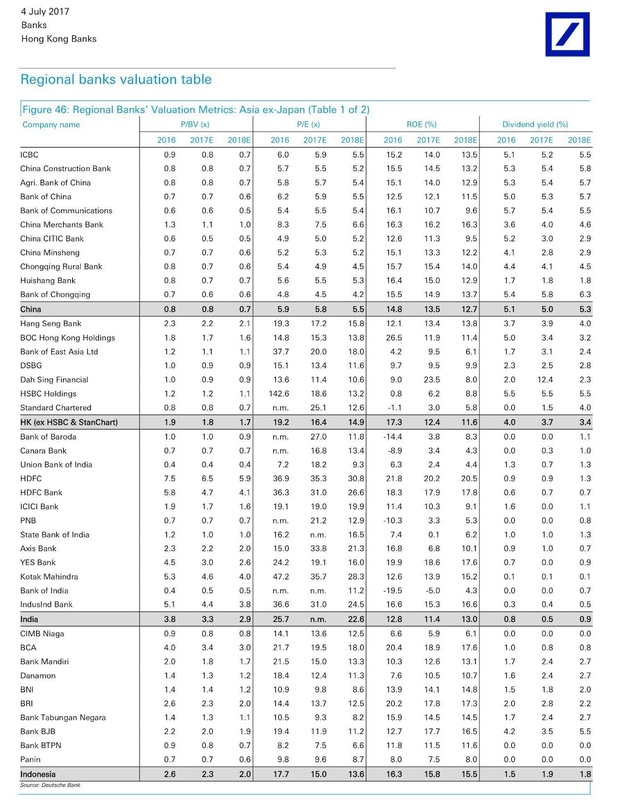 As at the end of 2016, Dah Sing Banking’s capital adequacy ratio is 18.3%, and Tier 1 capital ratio 12.7%. It issued USD 250 million subordinated debt same year. 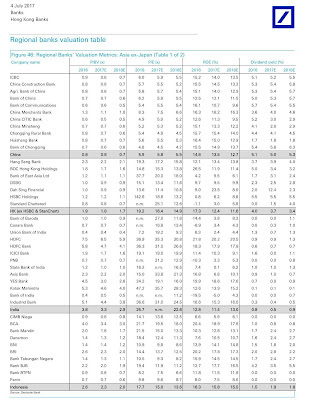 In that respect, it is in a better financial shape than, say, East Asia Bank (23), a bank peer of a larger scale. The insurance policy distribution agreement signed not long ago should be able to bring forth an additional fee income in the next 15 years. And its liquid assets table is solid. All of this points to one thing. The Group doesn’t need such an ample amount of cash on hand. Instead, they'd need to come up with an answer to the following question: how to manage their capital in a better way? After all, this, as a longer perspective, would be the essence of the matter. Godahsing.com has always advocated unfolding the hidden value of the Dah Sing Group. By encouraging dialog and positive feedback, we’ve assisted the shareholders and the public to have a better understanding of the Group’s potentials. So far more than 250 investors signed up, and more than $230,000 donation received (planned to re-donate to non-profits eventually). Those who have agreed to act together would represent a total holding of more than $100 million of Dah Sing Group shares. Besides, our initiatives are gaining endorsements by institutions. 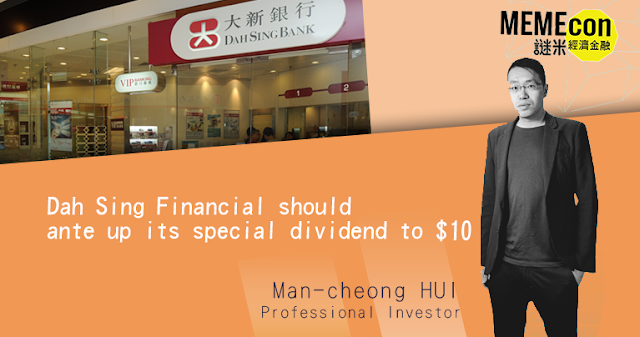 First, we advocate that Dah Sing Financial should distribute special cash dividend as much as they can. Second, the Group should restructure by way of distributing in specie of Dah Sing Banking and the Bank of Chongqing (1963). Third, the Group should consider facilitating MDah Sing Financial should ante up its special dividend to $10&A potentials in the mid-term. While agreeing that a special dividend has improved the trading multiples of Dah Sing Financial and Dah Sing Banking, the recent Deutsche Bank report mentioned above has also asserted that further corporate actions could help unfold more value in both companies. For example, distributing in specie of the two banks can uplift the trading volume of Dah Sing companies’ shares and align the interest of Dah Sing Banking with Dah Sing Financial, its mother company. Not to mention, that the remaining insurance business could thus be put up for disposal. All in all, we are far from satisfied with the amount of the special dividend. We urge the board of Dah Sing Financial to consider ante up it to at least $9.85 per share. I will send copies of this article, by mail, to the directors of Dah Sing Financials and the Bank of Tokyo-Mitsubishi UFJ. Shareholders. As a genuine gesture, please express your much-needed views by fax (25985052), by phone, or by mail. The Group’s registered address: 36th Floor, Everbright Center. Please note that the building has been renamed.